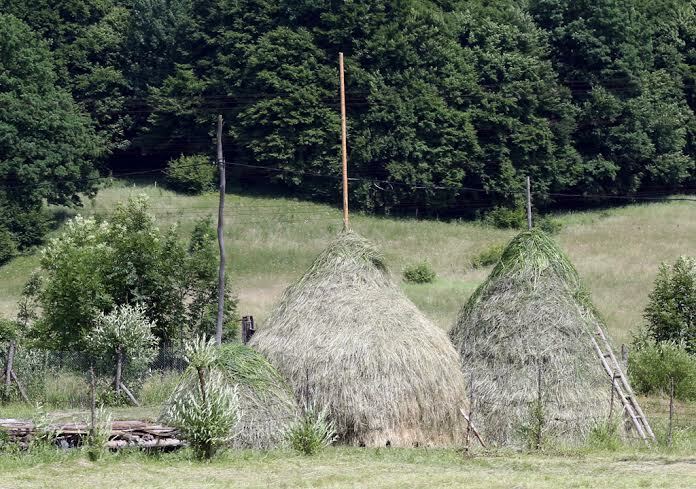 There were many unique foods in Transylvania. 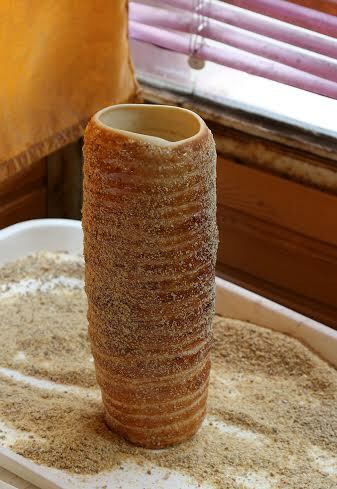 But one of the most intriguing was this Kürtös Kalács, or chimney bread. We came across it on our way from Zabola to visit the buffalo farm near Westendorp. 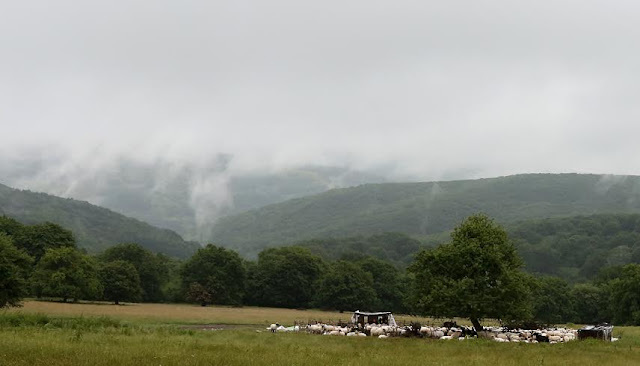 The scenic drive took us through beautiful countryside and little Saxon villages. It was fascinating to see the remains of some of the Communist collective farms growing potatoes, sugar beet and corn, and people saving hay in the fields. Here and there on the roadside there were little shrines. Cattle grazing in the fields and shepherd looking after their sheep and goats. 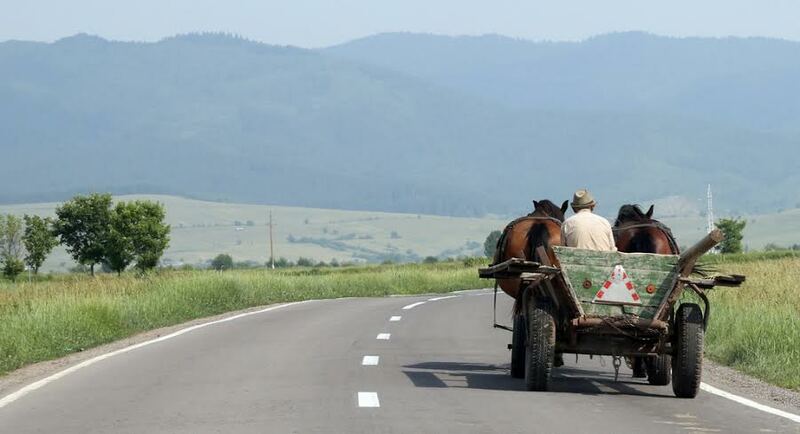 Romany Gypsies were selling wild strawberries along the road for 15 lei a punnet. And in the villages people were selling their produce from stalls on the side of the roads: piles of watermelons, farmhouse cheese and homemade breads. 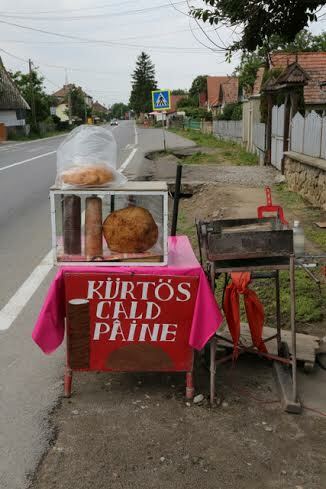 There were many stalls selling this kurtos, with cald paine - hot bread - written underneath. I was really curious to buy some and learn more about how it was made. 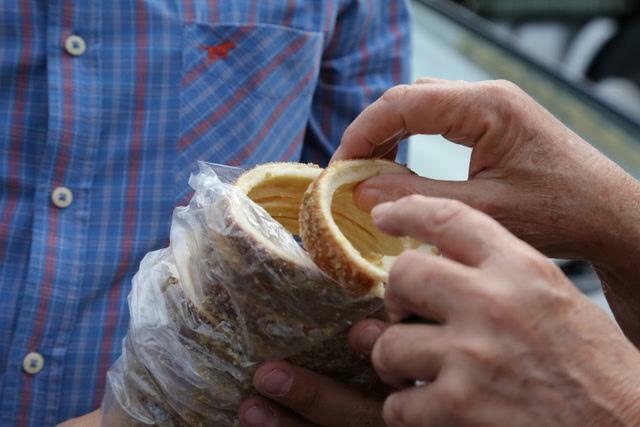 Our driver was amazed that we didn't know about it, as it's a very common Transylvanian bread. 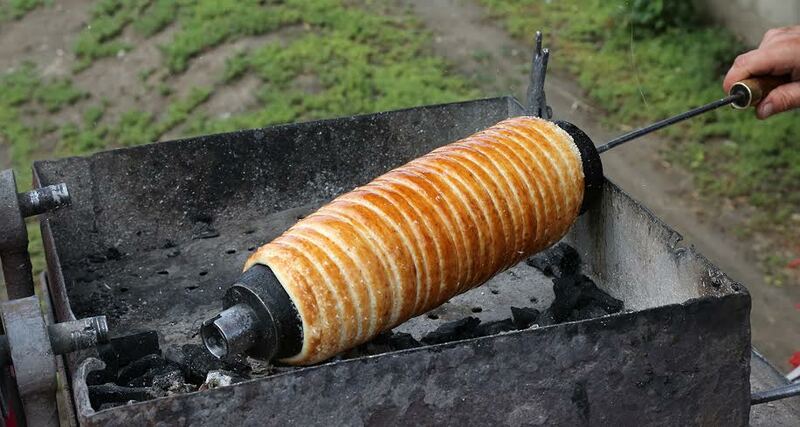 A helix-shaped pastry cooked on a rotating spit over a charcoal fire. They were traditionally a family affair, made on yard-long spits to celebrate weddings. But as with made treats of yesteryear, what used to be a special occasion food is now eaten more regularly all over eastern Europe... and beyond. Romanians have brought chimney breads with them as they settle - there are now bakeries in New York, London and - I've just Googled chimney cake and surprise, surprise you can even get it here in Ireland! Today they are made on a more commercial scale in restaurants and bakeries, and tend to be made in electric ovens on automated spits. Taking her sweet yeast dough, she pulled off a piece, weighed it and she rolled it on a wooden board with her palms into long strip. 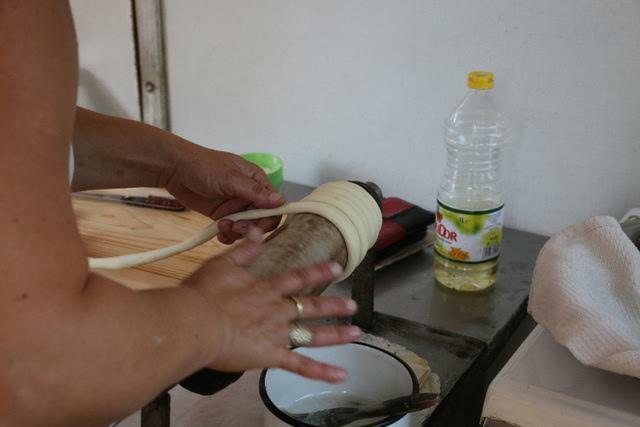 She then deftly spun the dough around an oiled wooden spit, before rolling the outside in sugar. She brought it outside onto the pavement and cooked it over a charcoal brazier, fanning the charcoal as she turned the spit. As it cooked, the sugar gradually caramelised on the outside. 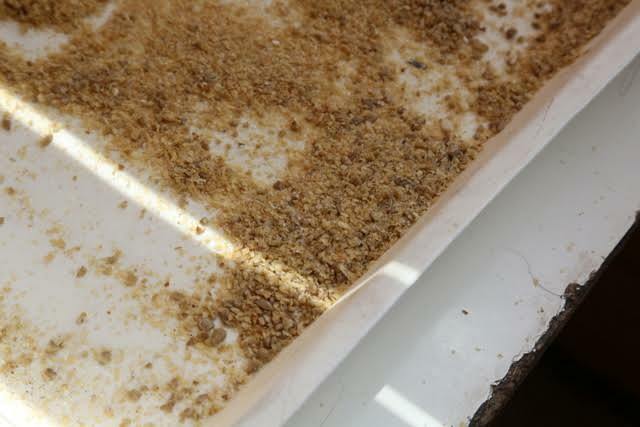 Back inside again, she rolled the whole thing in a mixture of finely chopped walnuts, pistachio and a sunflower seeds. 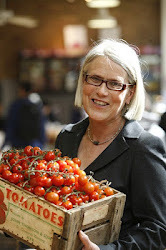 She slid the warm bread - a coil with a hollow centre, hence its name chimney bread - off the timber spit and slipped it into a cellophane packet. You unravel it to eat it, crunching into its delicious caramelised, nutty crust. It was really delicious. 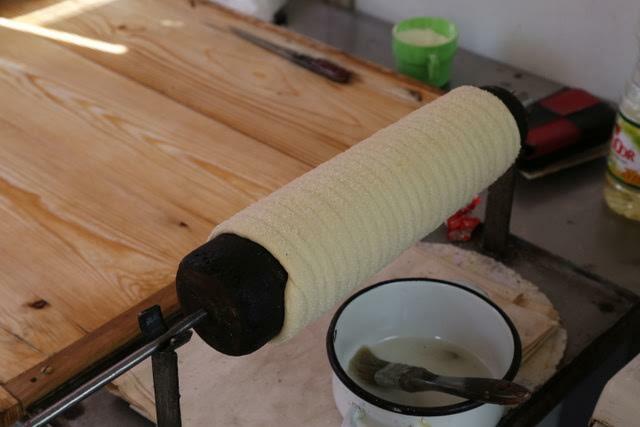 I am seeing the preparation of the chimney bread for first time. Thanks for sharing.